What is Sinew Injury Poultice? 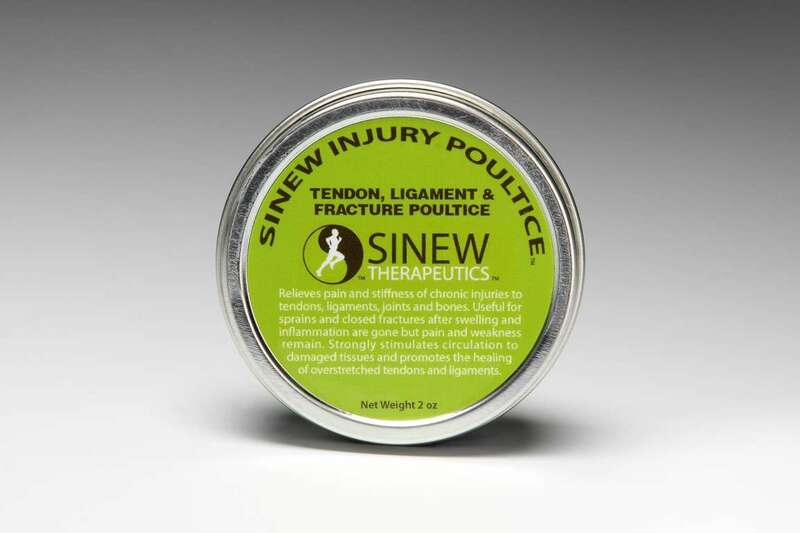 Sinew Injury Poultice is a safe and effective topical herbal remedy specially formulated for use on chronic injuries such as sprains or bone fractures where the swelling and inflammation are gone, but residual pain and stiffness remain. Sinew Injury Poultice contains many warming herbs aimed at strongly stimulating circulation to damaged tissues to further promote the healing of overstretched tendons and ligaments. This poultice (balm) is particularly useful if your injured area is more painful in cold and damp weather. * Significantly stimulates circulation to damaged tissues. * Promotes the healing of overstretched tendons, ligaments and muscles. * Decreases pain from cold and damp weather. * Relieves residual pain and stiffness. 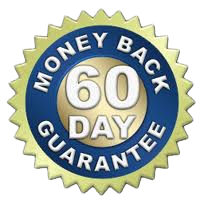 * Promotes fast pain relief and quicker injury recovery. * No known side effects. How do I use Sinew Injury Poultice? Not for use on swollen, inflamed areas. Apply a layer of the herbal poultice over the injured area. Cover with gauze or paper towel and wrap with rolled gauze or tape into place. Leave on for 6-24 hours (can sleep with it on), and then 6-24 hours off to allow the skin to breathe. Repeat applications for up to 2 weeks if necessary. Full instructions are on the label. 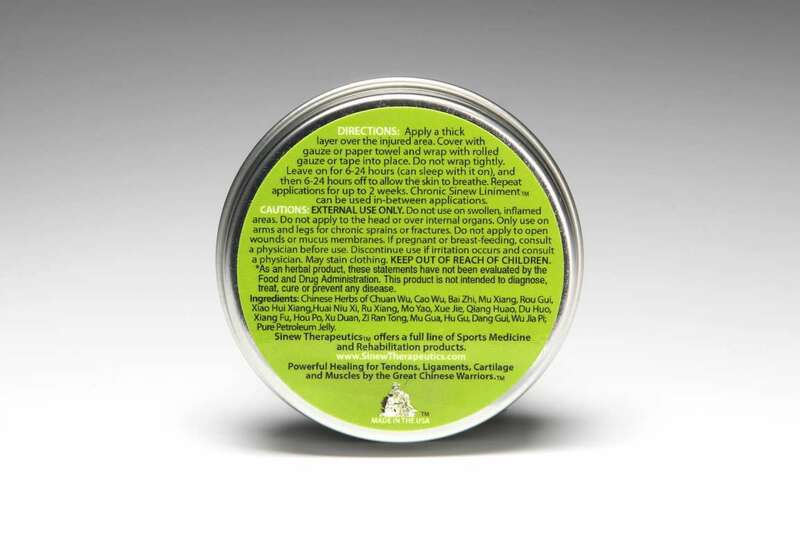 Chronic Sinew Liniment; Sinew Relaxing Soak and/or the Sinew Warming Soak can be used in-between applications. Sinew Injury Poultice contains the following laboratory-tested Chinese herbs in therapeutic dosage: Chuan wu, Cao wu, Bai zhi, Mu xiang, Hou po, Xiao hui xiang, Rou gui, Ru xiang, Mo yao, Xue jie, Qiang huao, Du huo, Xiang fu, Niu xi, Xu duan, Zi ran tong, Mu gua, Dang gui, Wu Jia Pi; pure petroleum jelly. Results are felt within the first week of use, and in most cases within the first day or two. How is Sinew Injury Poultice different from other pain relieving products on the market? In conventional medicine, many pain relieving products are aimed at just treating the symptoms, such as by providing an analgesic effect on the injured area to reduce the sensation of pain, thereby masking the pain. Sinew Injury Poultice contains Chinese herbs that kill pain, but painkilling herbs are not mere analgesics that mask pain. Chinese herbs have been used for centuries and are known to have medicinal properties that treat the root cause of the pain because they contain natural energetic substances that subtly yet powerfully correct underlying deficiencies and remove obstructions in the injured area. The herbs used in our products specifically work to break up stasis, or stagnant blood and fluids, and increase circulation to the injured area. Stasis is what causes swelling, inflammation, hematoma, and the discoloration of bruises. Stasis can prevent your body from healing fully and slows down the healing process. The herbal properties work to eliminate this so the body can reabsorb the fluids and increase the flow of blood so that pain relief and healing can take place. The increased circulation aids in this process and brings vital oxygen and nutrients to the injured area so it can repair and heal.